Quantum Mist Tower crop sprayers from Croplands Equipment feature six, lightweight axial Quantum Mist fans that are mounted on a vertical tower. The fans deliver high volume, turbulent air and can be directed to specific parts of the canopy, improving overall coverage, reducing drift, and making it ideal for applying chemical thinning sprays, bud-breaker compounds, and seasonal growth regulators. “If I hadn’t purchased the Tower Sprayer we would have had to purchase two air blast sprayers which would have cost more, to get the same area sprayed. I would have had to employ an extra driver too,” says Brookfield Farm owner Brendon Downey. Assisted by a self-contained hydraulic power-pack, a low HP tractor trailing tower crop sprayers can save up to 30% more fuel than a conventional air-blast sprayer. The low spray pressure of the Tower Sprayer (between 3-12 bar), compared to 20-30 bar for air-blast sprayers, reduces wear on all components of the spraying systems, including the pump, nozzles, electric valves, and flow meter, meaning savings are likely to be made on annual maintenance. Mr Downey also notes the sprayer’s faster ground speed has increased efficiency on his property. “I like the concept of getting across the ground quicker. Early in the season when the buds are breaking we get the sprayer up to 12kms per hour. Later in the season we run it about 8km per hour but even at the faster speed the Tower Sprayer provides better coverage than our air blast.” This is also due to the use of the super spreader, DuWett, in conjunction with the Quantum Mist fans. Trials using DuWett have yielded extremely impressive results including reduced water rates, improved coverage and increased speed. Mr Downey is keen to discuss the benefits of Quantum Mist technology and at a recent Fruitfed Supplies field day he did just that inviting local pip fruit growers to see the sprayer in action on his property. 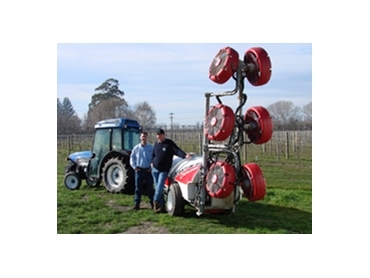 Mr Downey also uses the Tower Sprayer to spray his 100 acre vineyard and explained that shutting off the top two heads helped to reduce chemical wastage.” Quantum Mist spray technology has been used in many horticultural crops including, grapes, citrus, kiwifruit, berries, and apples and was specifically developed to reduce growers’ application and operational costs.